The curious incident was not a dog in the night (Sherlock Holmes) but a fainting spell! See Friday. 3:00 - 12k. 6k very easy warmup. Felt ok after stretching (after warmup), but legs still a bit heavy. Rest. To a hot spring resort with my wife for wedding anniversary. Ate a lot and drank a lot of wine. 4:58/3:59/4:03/3:14/3:15/3:09/82 (200 jog plus a bit of walk in bet.). Felt ok, but just didn't have it to run fast. Steady rain, puddles on track, but that was not really the problem - just had no oomph. 12:00 - 16k very easy. Legs very tired and heavy. A long, slow run. Then came home, went upstairs, and fainted! Fortunately my wife heard me fall. I guess I hit the floor hard (got a few scrapes). All I remember is feeling a bit woozy. Woke up with my wife leaning over me with her phone in her hand, calling an ambulance. I went downstairs and thought I was ok, but started feeling woozy again, so rode to the hospital. By that time, I was ok. Very strange. I think it was a combination of not eating much the day before or in the morning, sitting in the sun for a while, then doing a gym workout without drinking anything. So I have to eat a bit more, and definitely drink more in the hot weather. 58.6kg - lost 1kg in one day - again, this is measured early in the morning. Felt fine today, so did a hard workout, but not real fast and cut it down a bit. 14:31 (abut 4:50/k), 14:01 (abt. 4:40/k). 500s in 2:04, 1:59, but it may have been a bit short. Legs very stiff, otherwise felt ok.
12:00 - 21.2km. 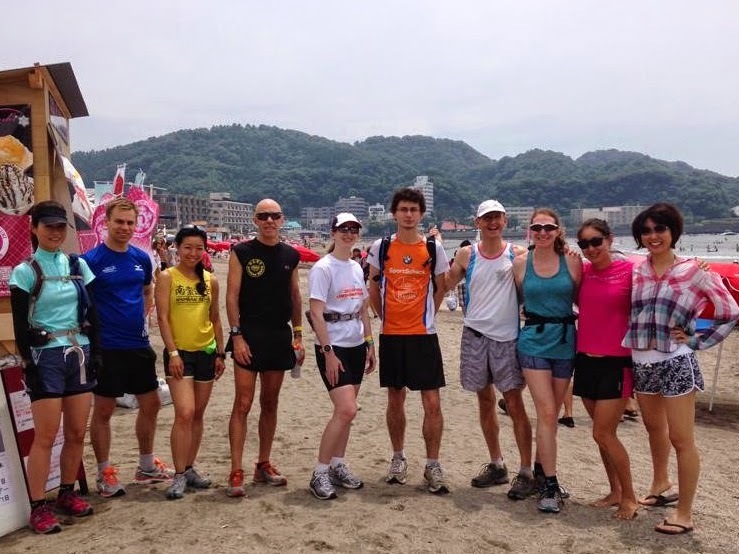 Went to Zushi beach (below Yokohama) for a run up in the wooded hills with 7 other people. 2:40 running time, total 4 hours with many stops for rest, water, views and to let people catch up. Easy pace the whole way, but LOTS of uphill, including many stairs, stone steps, steep hillsides. Legs were ok, no soreness, but got very tired. Beer and BBQ on the beach afterwards, an enjoyable day. 27C/81F, but quite a bit cooler up in the woods. The hills in the background are not exactly where we ran, but hills just like that. Crikey! The fainting was probably caused by those fairly harmless factors you listed (I've done it myself), but be careful nevertheless; it could potentially be more serious. Take care. I feel dizzy and close to fainting when I push myself and then stop suddenly. Walking up stairs can even cause this. I found it very hard to train in the Tokyo humidity myself. Look after yourself Bob. Are you due for one of those famous Japanese overnight WOF checkups at your local hospital anytime soon? They are legendary and give real peace of mind. I used to faint at school - probably dehydration thinking about it now. I also have low blood pressure which could have been an underlying factor. Can't beat a BBQ on the beach! No Niggles - How Nice!